Several community-based organizations on Tuesday filed a federal class action against the City of Chicago and Chicago Police Department (CPD), highlighting CPD’s unconstitutional Gang Database, and urging City Council to take action. The Chicagoans for an End to the Gang Database, a coalition derived of individuals and diverse community organizations, such as Black Youth Project 100-Chicago, Blocks Together, Brighton Park Neighborhood Council, Mijente, and Organized Communities Against Deportations spoke out against what they call a perilous database. “The Chicago Police Department documented me as a gang member when I was just 14,” said Lawrence Vaile, one class member. “The police would stop me and ask me what gang I’m in, they would slap me for lying to them because the computer shows them I’m in the gang. This put me in danger from the cops and from the streets.” The suit was filed on behalf of four individual plaintiffs, three Black and one Latino. Each plaintiff was falsely identified as a gang member and has since been subjected to irreparable harm and harassment because of the wrongful description. “As long as the Gang Database continues to indiscriminately add Latinx and Black Chicagoans to their list, Mayor Emanuel cannot call Chicago a Sanctuary City for anyone. Making Chicago safe for immigrants starts today with making sure that the gang database stops being a list of people for ICE to pick up during immigration raids,” said Tania Unzueta, Policy Director for Mijente and one of the organizational plaintiffs. “This database hasn’t led to positive change for the Chicago communities directly impacted. Our tax dollars should not be spent on instruments of racism, or on tools that criminalize and scapegoat people of color. Chicago’s so-called problem with violence is rooted in our city’s problem with racism and inequality. Our resources should be used on the tools, projects and initiatives that enhance our communities, bring ordinary people together, and allow us to prosper,” said Todd St Hill, Member of BYP100. 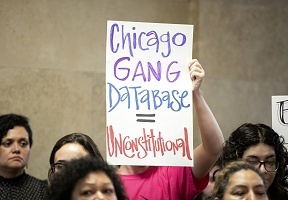 Members of the coalition believe CPD’s Gang Database provides “incorrect, inconsistent database to third parties” which ultimately restricts job opportunities, access to public housing and public education as well as possible deportation. 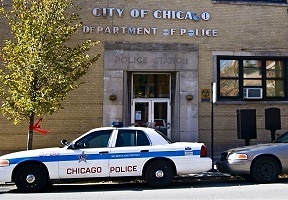 The lawsuit notes that CPD has not developed any consistent guidelines on inclusion in the Gang database, such as information on an individual’s criminal conduct or active gang activity. Instead, CPD officers have unlimited discretion to add names to the list. “CPD has long been on notice that the Gang Database discriminates against Black and Brown Chicagoans and violates people’s constitutional rights by creating barriers to employment and immigration relief, subjecting people to unlawful detention and searches and seizures and constant police harassment and surveillance. The gang database is riddled with inaccuracies and serves no legitimate law enforcement purpose—all it does is further institutionalize CPD’s well-documented policy and practice of racial profiling,” stated Vanessa del Valle, counsel for the Plaintiffs in the lawsuit. The CPD confirmed that, as of May 2018, the Gang Database lists more than 128,000 adults. Although data on juveniles was not released, a new report from the University of Illinois at Chicago (UIC) Policing in Chicago Research Group estimates that the total number is closer to 195,000. Of those, 95 percent are Black or Latinx.